Click image to download Adobe .pdf of poster. The Leona Valley Sertoma 2019 Winter Newsletter is out! Bridget Razo deserves accolades for a job well done. Four pages of informative articles and beautiful photos that do a terrific job of sharing what the members of Leona Valley Sertoma are doing to “Make a Difference”. You can also find the Officer’s List and a Calendar of upcoming events and activities of import to all who live in the Lakes and Valley areas of our corner of Los Angeles County. Below is an excerpt from the 2019 Winter Newsletter. Find the complete 2019 Winter Newsletter further down the page and click on it to download a PDF copy. Sertoma’s “Gala Under the Stars” raised more than $10,000 to help care for and train a Service Ambassador dog for a hearing-impaired person, allowing us to name the puppy on behalf of our organization. The chosen name was Leona V in honor of Leona Valley. Leona V was born on September 13, 2018 and is now with her puppy raisers Chuck and Connie Braddy in San Diego. She will be there for 18 to 20 months to prepare for her advanced training of an additional six to nine months at the Canine Companions for Independence Training Center in Oceanside. If Leona graduates after learning 30 basic commands and socialization skills, her projected “turn-in” date will be May 20, 2020, where she will be presented to her new Partner for Life. Leona will then become the ears, hands and legs of her human partner and will be considered a goodwill ambassador. “Some people wait a lifetime for a miracle, but Canine Companions for Independences raises these special dogs one at a time.” Thank you for helping us make this miracle happen. 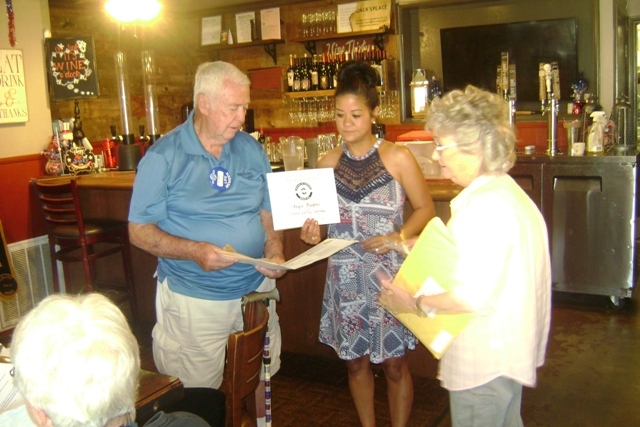 Please check our website at www.leonavalleysertoma.org and remember that we are always hoping for new members to help us be the good we want to see in the world and in our community. We meet the first and third Saturday for breakfast at 8 a.m. at Jack’s Place, 40352 90th Street West in Leona Valley. Why not share this post on Facebook and check the box to be informed of future post from Leona Valley Sertoma. Are You Ready for what 2019 will bring? The members of Leona Valley Sertoma look forward to what the new year will bring and to continuing some of their long-standing programs and events. These include the 2019 Scholarship Program and the St. Patrick’s Day Dinner, both have been around for quite some time. Scholarship Applications for 2019 are here! Can you believe it? The Leona Valley Sertoma Scholarship Program is twenty years old this year and still going strong. Leona Valley Sertoma established the Leona Valley SERTOMA Scholarship Program to identify and reward local students who have shown personal and intellectual qualities through academic achievement, as well as participation and leadership in extracurricular and community activities. Leona Valley Sertoma has given out close to $50,000.00, in scholarships since 1999. The goal of the program is to serve the needs of local graduating seniors and those community college students transferring to continue their education. Scholarship consideration is also open to students attending Community college who live in Leona Valley, Green Valley, Lake Hughes, Three Points or Lake Elizabeth, who are transferring to a 4-year college. Our most recent scholarship recipient was Margaret (Maggie) Mihaljevich. Click on her name to read the post and we welcome you to share our post on your Facebook page. Another long-standing event is our annual St. Patrick’s Day Dinner. This year, Leona Valley Sertoma presents a Traditional Corned Beef Dinner, with all the fixings, for St. Patrick’s Day, Sunday, March 17, 2019 – 3:00 to 6:00 p.m. It is being held at the Leona Valley Community Building, 8367 Elizabeth Lake Road, Leona Valley, CA. In addition to the corned beef dinner, your dinner includes a GREAT selection of desserts, coffee & tea with drinks available at an additional cost, including a BAR featuring Irish coffee ~ ID Required. Soda and water are also available. Click on flyer to download a .pdf copy. It’s that time of year again! Time to get together in celebration of the season and in recognition of people who deserve to be recognized. For Leona Valley Sertoma members, December has two long standing traditions, the Senior Christmas Dinner, held on December 2, 2018, and their annual Christmas party for the members. The Christmas party is an opportunity to enjoy fellowship with their fellow Sertomans and to hand out the Awards and was held on December 1, 2018 at the home of member Shirley Kraft. Leona Valley Sertoma once again hosted its annual Senior Christmas Dinner on Sunday, December 2, 2018 with plenty of good cheer and delicious food to go around. This event is not a fundraiser, but rather a thank you to our senior citizens. After all, Leona Valley would not be what is is without them. The photo on the right says it all — “Service with a Smile” along with a good helping of “Service to Mankind”. These volunteers were so happy to serve the seniors who attended the annual Senior Christmas Dinner. From the left are members Catherine Lord – Bridget Razo and Teresa Braley. Also lending a helping hand are 4-H Club Members Evelyn and Madeline Copeland. Two very special ladies took on the duty of serving up some sweet desserts at our 2018 Sertoma Seniors Christmas Dinner. Left, Beverly Brownfield – Right, Betty Wade. On December 1st, Mary Thomas received the “Sertoman of the Year” award representing her many years of loyal service to our organization. Mary has made quite an impressive contribution to the longevity and success of our small but mighty group – ALWAYS keeping us together with a smile and a loving hug. On December 1st Steve and Tamara Reaves were surprised with the Sertoma “Service to Mankind” award for their excellence in community service. Their entire family has not only provided a special comfort zone for Leona Valley, but have worked very hard organizing events that would appeal to the entire family.